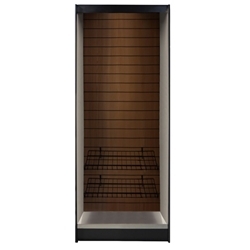 D & S Vending Inc - ASMMS271DW - All-State Micro Market Stand Kit- Walnut, 78" x 27" x 12"
Home → Vending Machine Parts by Manufacturer → All-State Micro Market Stands → ASMMS271DW - All-State Micro Market Stand Kit- Walnut, 78" x 27" x 12"
All-State Micro Market Stand Kit- Walnut, 78" x 27" x 12". Built with durable double wall steel construction. Vinyl clad steel slats with walnut finish. LED light for better product display included. DISPLAY KIT WITH 6 SHELVES, 6 BASKETS AND 12 OF THE 8" PEGS INCLUDED. Must Ship TRUCK and arrives fully assembled. DS25CC - Coca-Cola/Coke Label- 2 5/16" x 3 1/2"
DS25CFPT - Diet Pepsi Caffeine Free Label- 2 5/16" x 3 1/2"
DS25DP - Diet Pepsi Label- 2 5/16" x 3 1/2"
DS25P - Pepsi Label- 2 5/16" x 3 1/2"